Apple cider vinegar is another common "find in your kitchen" product that has multiple uses and benefits for your health and for your beauty. This particular type of vinegar is a light amber color and is made from fermented apple juice. Apple cider vinegar is a completely natural product that has AMAZING health benefits when ingested on a regular basis and it is no surprise (to me personally) that it would have AMAZING effects when used directly on your skin and hair. First off, I just want to point out the health benefits that you get from this stuff before you go off showering and bathing in it (it can be a bit pricey if you do that..), and hopefully you'll seriously consider incorporating this into your daily routine. Now I want to get into the BEAUTY benefits that apple cider vinegar has. These little home beauty remedies that my family has used for generations for their skin and hair has included apple cider vinegar. However, when I was young, I really hated the smell of the stuff (I would be surprised if anybody actually enjoyed the smell of vinegar). But don't let that throw you off. 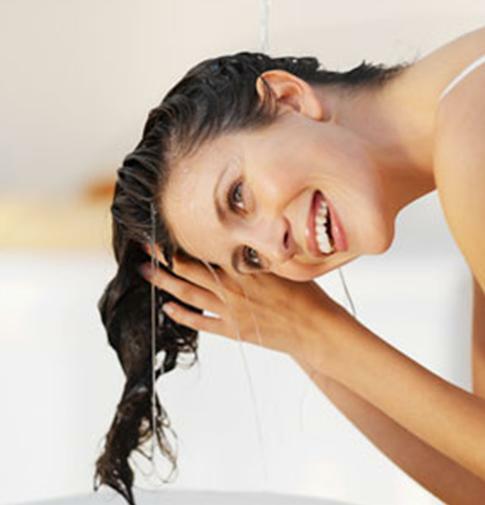 After vinegar evaporates, the smell is completely if not mostly gone and it leaves you with beautiful hair and skin. Truly, it's amazing stuff. Apple cider vinegar has multiple uses and in my opinion, is definitely a recommended product to have in your kitchen, or beauty table, at all times. 1) Weight loss - Some data from recent and older studies show that apple cider vinegar has helped to prevent the body from storing fat. The main ingredient in this vinegar that suggests this is acetic acid, which has been proven to aid in weight loss if ingested on a daily basis. 2) It helps balance the body's pH - With a balanced pH, you would have more energy, as opposed to having a low pH which science shows leads to a lack of energy and leaves you more prone to illnesses and infections. 3) It can relieve heartburn instantly - Studies have shown that apple cider vinegar helps correct low acid levels in the stomach and therefore reduces heartburn. Take a bit of this vinegar with a glass of water to have instant relief for heartburn. 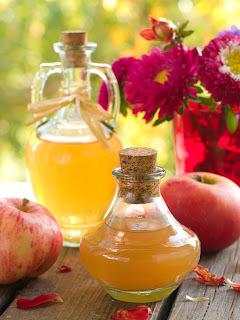 4) Lowers cholesterol - Recent studies have shown that apple cider vinegar has been proven to reduce cholesterol. However, the studies have been focused on mice, so the effects of people is unknown. Some testimonies have proven this theory true, so why not give it a try? It does you no harm (if taken moderately). 5) Reduces effects of allergies - Apple cider vinegar has been proven to help with congestion and the reduction of mucous. It can also be useful to reduce the effects of a cold. 1) Gets rid of dandruff and gives hair volume and shine - Mixing a half and half solution of apple cider vinegar and water helps regulate the pH of your scalp and discourages the growth of a yeast-like fungus thought to trigger dandruff. After rinsing with this solution, your hair will have a nice shine and will lighten your hair of any shampoo residue it has been building up, and therefore increase its volume. 2) Gets rid of Acne - This has amazing benefits for your skin, regarding acne especially, due to the fact that it regulates skin pH. However, you should NOT use full strength on your skin, as it can irritate skin and make acne worse. ALWAYS dilute apple cider vinegar with 2 parts water before placing on skin. 3) Regulates skin pH - Mix apple cider vinegar with two parts water and use as a cleanser for your face every night (ONLY once a day). Here's a secret; chop up some horseradish and add it into this mixture. Let it sit for two days before use. This does wonders for your skin. 4) Gets rid of warts effectively - If apple cider vinegar is applied to the wart (covered with a bandage) overnight, the wart will eventually fall off. This treatment will have to continue for a few more days in order to prevent the wart from coming back. 5) Can be used as a massage oil to relieve aches - Rubbing apple cider vinegar on a cramp, sore feet, or hands is proven to give obvious relief after massaged for a small amount of time. It can also get rid of foot odor. *Extra number 6 - Can relieve and reduce sunburn when added to your bath water. Soak in this water for 10 minutes for relief. 1) Apple cider vinegar can be used as a flea repellent on your pets. Just add some water in a spritzer bottle and mix with the vinegar. 2) It removes stains from teeth. 3) It can be used to clean your counter tops and bathroom when diluted with water and gives it a nice apple scent once evaporated.